Andover vs. Elk River, Tuesday, Dec. 18, 7 p.m. Andover (6-0, 1-0) and its impressive special teams unit faces Northwest Suburban Conference foe Elk River (4-3, 1-0), which has scored at least four goals in its first five games. The No. 2-2A Huskies have converted an astounding 42.9 percent of their 21 power plays while allowing only one goal in 22 penalty-kill opportunities. Virginia/Mountain Iron-Buhl vs. Breck, Saturday, Dec. 22, 3 p.m. Virginia/Mountain Iron-Buhl (2-4-1, 1-2-0) plays two metro-area games in two days, including visiting Breck (2-5-0, 0-1-0). Both teams have struggled so far, but each has also faced a tough early slate of opponents. This marks a chance for at least one team to feel like its back on track heading into winter break. Cretin-Derham Hall vs. Edina, Friday, Dec. 21, 7 p.m. No. 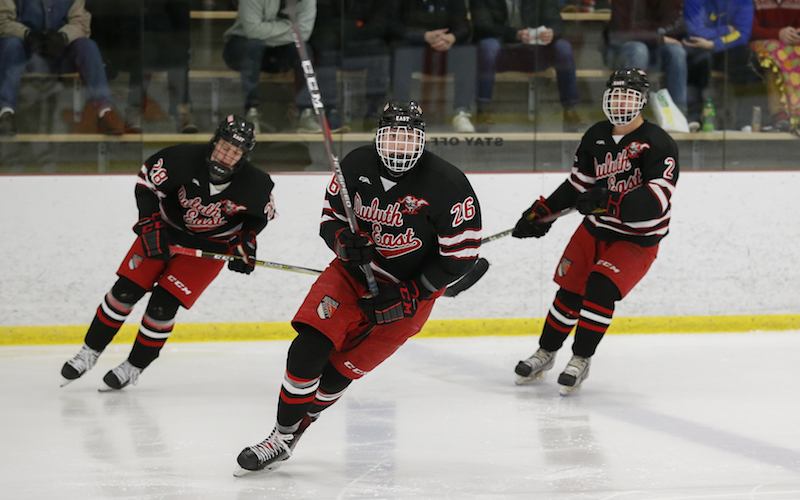 3-2A Edina (6-0-1, 0-0-0) remains unbeaten on the heels of a big offensive showing at its home holiday showcase this past weekend, scoring 20 goals in three games. Cretin-Derham Hall (2-3-0, 2-1-0) and its 4.40 goals-per-game average has been involved in some high-scoring games, which should keep the Raiders competitive in every game this season.